In the Occidental West, the tradition is the painter should represent the physical. Not so in Asia: for millennia the artist's responsibility was to communicate the living energy, the Qi, of what was being painted. Xie He (Hsieh Ho - 6th century) wrote that a painting should have: Breath - Harmony Life - Movement (Qi-Yun Sheng-Dong - 气韵生动). Qi, the first character, primarily means is "life-force." For Xie He this qi is in all humans, animals, and plants. It is what grants being to everything in nature, everything in the universe. Yun, the second character, suggests "melodious, elegant, and harmonious." Sheng by itself means: "to give birth, grow and live." Dong by itself means: "physical movement." Together Sheng-Dong means, "producing the movement of life." In other words, there must be a harmonious Qi-Energy resonance between the painter, the act of painting, and what is painted—that is what grants life to a painting. Looking at such art brings the observer into this single unified experience. Others wrote about this, probably the most important principle of all Chinese aesthetics. "In painting a scene, when one succeeds in conveying the ch'i [qi] of each form, the result is an expression of the Ch'i that pervades the universe, and to do this, the painter has to transcend the limitations of the eye and delve into the secrets of nature." Wang Wei (8th century). [Mai-mai Sze, p.40]. "Utilize the charm of qi to accomplish the composition of painting and the form will be implicit." Zhang Yanyuan (Chang Yen-yuan )(c. 9th cent.) [Rose, p. 71]. 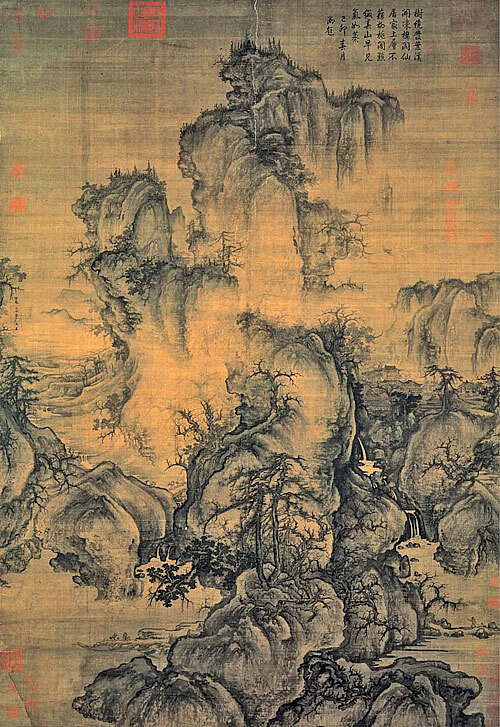 "Modern [i.e., 9th century] painters rather tend to excel in reproduction of shapes; though they do achieve formal likeness (verisimilitude) yet they are without spirit-resonance (qi-yun)气韵i how could such be called painting?" Zhang Yanyuan. European paintings most often use layers of oil paint on canvas to create a sense of realism. 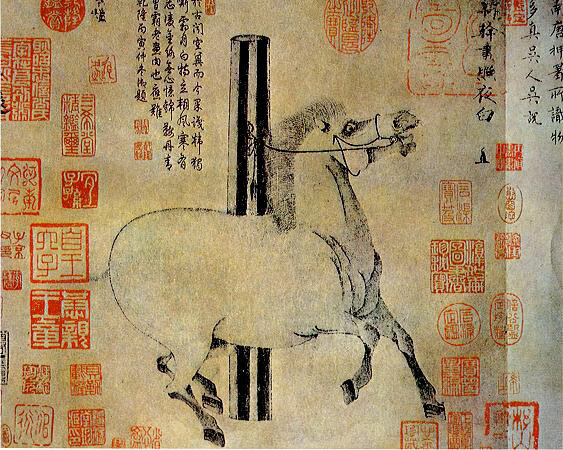 The Chinese worked with much lighter materials: ink or water colors on paper or silk. The use of the brush is instantaneous. The process for the artist is to gain a clear inner vision of the life-energy of what is to be painted. Anything that does not communicate that vision is eliminated. Like a gust of wind or a flash of lightning the brush touches the surface. Each stroke is spontaneous, and permanent. To effectively do this demands an incredible technique. Han Gan (8th century). Night-Shining White. Metropolitan Museum of Art, New York. This portrait with its lustrous eyes, bristling mane, flared nostrils and flying hooves evokes the enormous life energy of the favorite horse of eighth century Chinese emperor Xuanzong . (Kuo Hsi (Guo Xi) (1020-1090). Early Spring. National Palace Museum, Taipei. Auspicious clouds on an early spring day appear enveloping the landscape full of potential for life and renewal. Suggested by forms emerging from the mist, the land seems to awaken as the trees spring forth. A "misty vapor" is thought to be one of the earliest meanings of the word Qi. Wang Yuan (1642-1715) Meeting Friends in the Pine Pavilion. National Palace Museum, Taipei. 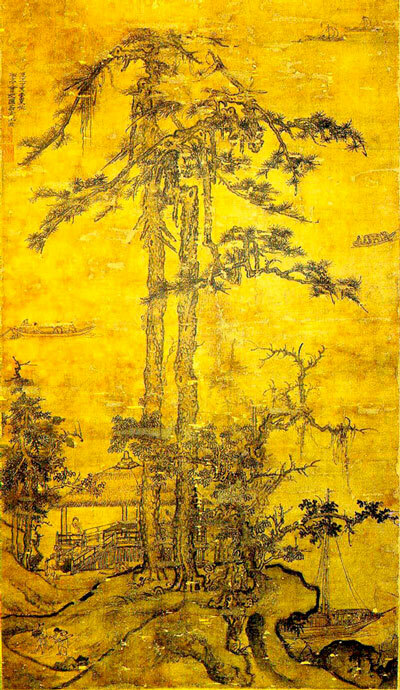 The two men (perhaps scholars) in the pavilion are depicted by the two pine trees: tall, long healthy life, impervious to the frost of the winter, close to each other, and existing harmoniously as a part of nature. This painting displays a singular qi existing among its people and nature. In summary: For thousands of years a fundamental method used in creating and evaluating Chinese paintings has been the artist observing, contemplating and communing with the qi of their subject—then having that qi fill their being – then leading and guiding that qi into their arms, hands and fingers into the controlling of the brush—then onto the paper, canvas, or silk, so that the viewer of the completed art object feels a sympathetic resonance with the qi of the subject of the painting. At its highest manifestation this becomes a transcendental experience of exultation where the qi of the subject, artist, process, painting, and observer merge and become as one. The process of working with qi to create an art object may (after a fashion) be reversed so that it becomes possible for an art object to offer a way of working with qi. The pattern now is an artist monk in meditation leads and guides internal qi within their own body and observes the effects it creates. Next the artist monk clearly visualizes this "internal view" to the degree that it appears in their mind as would a finished art object. Next the monk creates an external art object of what they saw internally. The final step is when a spiritual neophyte views this art object, studies and internalizes it, and by visualizing it learns to use and experience the qi itself. Now not only can a qi experience create a painting, a painting can create a qi experience. This may be experienced with the Diagram of Inner Energy Channels of the Human Body - The Nei Jing Tu (內经图). The original stele of the Neijing Tu. This is taken from a rubbing of a carved stone table, about 4 ft. high and 20 inches wide at the White Cloud Daoist Monastery in Beijing. It is attributed to Liu Chengyin and dated 1886. The figure is in profile facing left. To the far right is the spinal column and skull. The scenes depicted at different levels along the spine are alchemical changes occurring within the qi fields or dantians. The Chinese texts include passages of the scholar, poet and Daoist Immortal, Lü Dongbin . "When Qi-Energy returns, Elixir spontaneously crystallizes in the cauldron pairing water and fire. Ying and yang arise, alternating endlessly, the sound of thunder everywhere. White clouds assemble on the summit, Sweet dew bathes the polar mountain. Having drunk the wine of longevity, You wander free; who can know you? You sit and listen to the stringless tune, You clearly understand the mechanism of creation." (excerpt from the One Hundred Character Tablet). ^ Michael Sullivan. 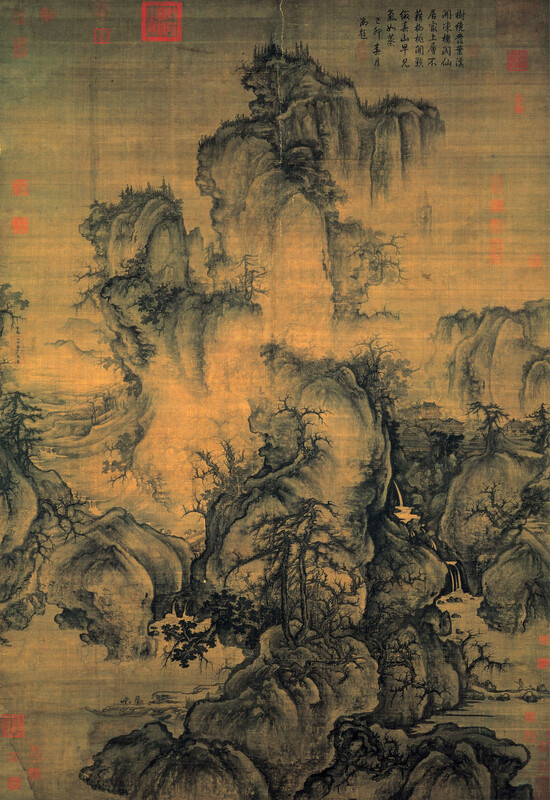 The Birth of Landscape Painting in China: The Sui and Tʻang dynasties. p.11. University of California, 1980. Mai-Mai Sze. The Way of Chinese Painting. Vintage, 1959. Yu Huan Zhang & Ken Rose. A Brief History of Qi. Paradigm Publications, 2001.